if you haven’t already you should go take a look at What’s Changing in the Next Major Release of Dynamics CRM http://msdn.microsoft.com/en-us/library/dn281891.aspx for a broad overview of the new release. You can download the Microsoft Dynamics CRM 2013 Software Development Kit (SDK) here http://www.microsoft.com/en-us/download/details.aspx?id=40321 to get up to speed regards the fantastic capabilities coming with CRM 2013. The Microsoft Dynamics CRM 2013 Software Development Kit (SDK) is for developers, system customisers, and report writers. 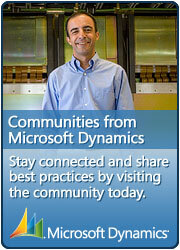 A great site to keep up to date with all the goodness is the Dynamics CRM Develop Center on msdn. http://msdn.microsoft.com/en-us/dynamics/crm/jj937218 where you can get all of the information you need to develop, design, and distribute solutions for Microsoft Dynamics CRM. This entry was posted in Information, MS CRM and tagged Dynamics CRM 2013 on September 26, 2013 by Rhett Clinton MVP.